The tests are run under two different scenarios: uncalibrated and calibrated. Uncalibrated performance equates to the ‘out-of-the-box’ settings a monitor ships with; this is the typical end-user experience as very few consumers engage in calibration of their displays before use. Calibrated performance is what results after the monitor has been put through the Spyder4Elite hardware-calibration process with the following parameters: 2.2 Gamma, 6500K colour temperature and 120 nits of brightness. These calibrated results demonstrate what the monitor is capable of when tuned correctly, but the results have limited relevance to most consumers who will not calibrate their monitors. iiyama promise more than 100 per cent of the Adobe and sRGB gamuts, and our testing revealed that the monitor clearly covers both colour spaces extensively. Adobe RGB is reported back as 99 per cent since the Spyder 4 Elite monitor analyser only reports coverage up to a maximum of 100 per cent of the colour space specified; coverage outside the colour space isn't considered in the final rating. The gamut diagram shows that the XB3070WQS covers more than the Adobe RGB spectrum in some areas but has a small slither that isn't covered, resulting in a one per cent deduction. 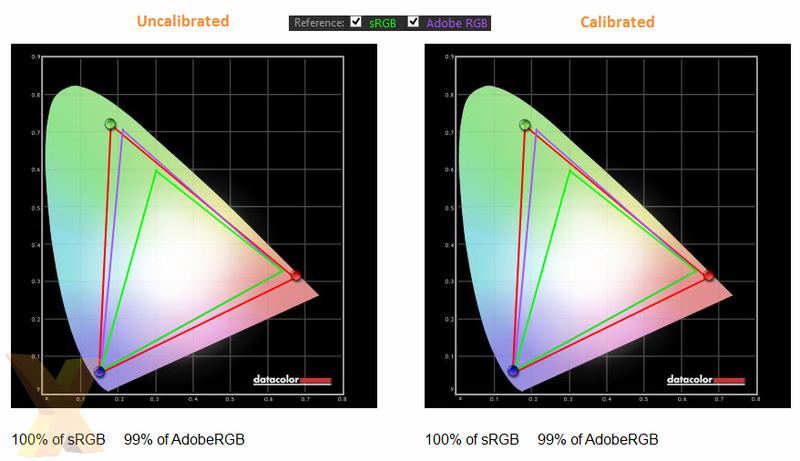 In truth, iiyama should market this as 99 per cent Adobe RGB and 100 per cent sRGB coverage, even if the Adobe RGB and sRGB ratios are higher than 100 per cent. Colour accuracy was superb out of the box with a Delta-E close to 1. Calibration, to our surprise, actually decreased colour accuracy implying iiyama has already done a superb job of calibrating the panel out of the factory. Colour uniformity is above average with only a minor hotspot in the top-right corner. This is reduced after calibration suggesting colour uniformity is linked to the overall brightness level in this panel.